Happy Motivational Monday! This week has been an exciting one for me, because I've been able to get back to running. I've done a few short runs (2-3 miles) and I feel really good. It's nice to run without an agenda right now--just to get some exercise, rather than "train for" an event. I've also stuck with my calorie counting all week, and I'm still doing really well with it. I'm now 62 days binge-free, which feels amazing. It's been a very long time since I've had a streak that long. I have some inspiring stories to share this week... enjoy! Like many of us, Ashley has struggled with her weight most of her life, and had yo-yo'ed a bit through the years. Over the last year, she made some serious lifestyle changes that she could stick with for the long haul, and she's lost 75 pounds! A couple of weeks ago, she reached a big milestone in her journey, when she completed a half-marathon. She even took over two minutes off of her mile time! She said it's an amazing feeling to be an active person these days--in the spring, she hiked the Grand Canyon (18 miles) in a day. 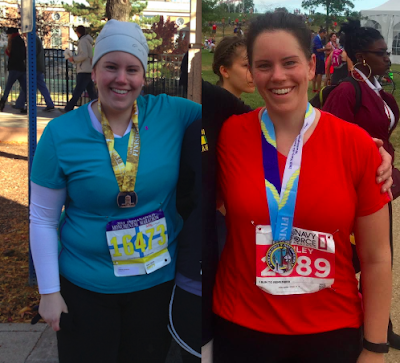 She's gone from run/walking her first 5K (photo on left) to running a half-marathon at a 10:30 pace (photo on right)! She said the small changes she made really added up, and that people shouldn't get discouraged if it takes a while to see results. Marine ran her first official 10K race! 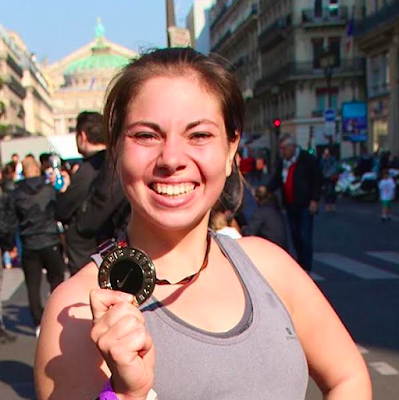 She did the 10K Paris Centre race--the weather was gorgeous, and the route was scenic. Her sister's boyfriend, who runs 10K in 36 minutes(! ), offered to run with her and pace her to finish under an hour, which was her goal. She ended up finishing in 56:38! She is proud for staying mentally focused throughout the entire race. 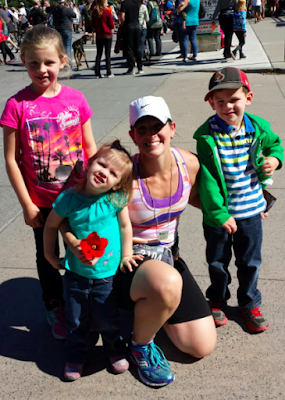 Lianne recently completed Canada's Army Run in Ottawa, Ontario. It was her fourth half-marathon! 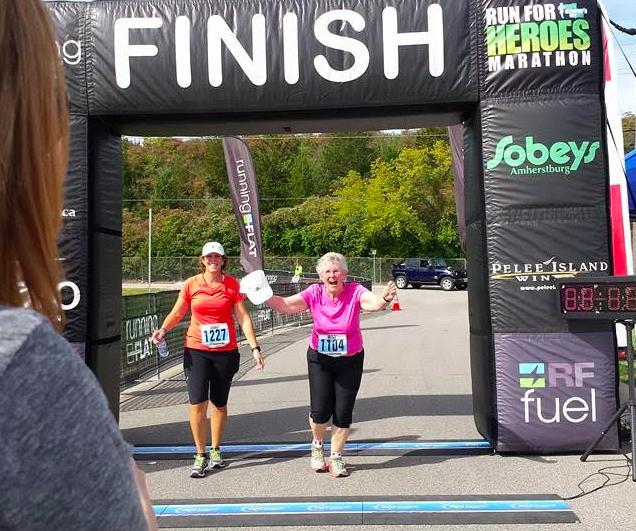 She had been planning to run with a running buddy, but her friend was injured over the summer, so Lianne ended up doing the race alone. She started out in front of the 2:00 pacer, and hoped not to see the 2:00 pacer for the rest of the race ;) She had lots of support on the course from her husband, her kids, her boss, and her boss's kids. She ended up crossing the finish line in 1:58:37, a new PR! About eight years ago, Suzanne was driving behind a car that had a 13.1 sticker on it, and she was inspired to start running. She started the Couch to 5K program, and ran her first 5K with a friend. 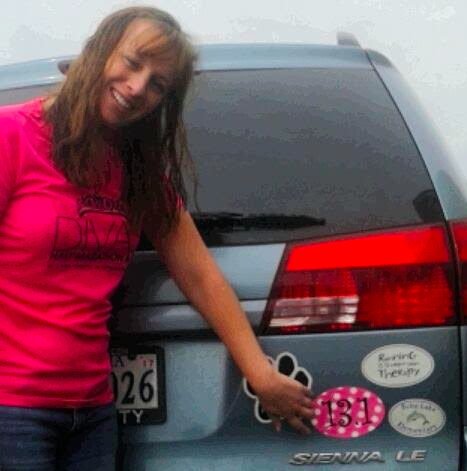 She then decided to earn a 13.1 sticker as a "bucket list" item, something she thought was nearly impossible. She was having problems with getting injured over and over, so she decided to try the Jeff Galloway run-walk-run method. She was finally able to break the three-mile barrier she kept hitting, and through training, she's even lost about 40 pounds! On September 26, she finally earned that 13.1 sticker that had inspired her so many years before--she ran her first half-marathon. She says the sticker is more to her than a symbol of running a half-marathon; it's a reminder that nothing is impossible if you want it badly enough. Congratulations to all of you! You have every reason to be proud. Don't forget to check out the Motivational Monday Facebook post for more stories (and to share your own accomplishments!). You mention going a long time without binging. What do you consider a binge? I use the official diagnostic criteria for binge eating: 1) Eating an abnormally large amount of food in one sitting; 2) Feeling out of control, unable to stop; 3) Feelings of guilt afterward. It's different from overeating because of being out of control. Thanks. I know you've talked about binge eating before and wondered what the criteria was. Good luck on maintaining your streak. Do you think "out of control" is the same as "mindless eating of anything in the house until you feel Thanksgiving full?"